We build and race FACTORY EDITIONS. Championship winning bikes, like this one. Thanks to its compact SOHC (single overhead camshaft) engine delivering explosive but controllable power, it is the weapon of choice for Red Bull KTM Factory Teams around the world. A lightweight chassis and a slim bodywork put the 450 SX-F FACTORY EDITION out front of the competition. A long list of special equipment such as a factory installed holeshot device, a floating front brake rotor and a new slip-on AKRAPOVIC muffler add to the arsenal that raises this limited edition model to a level that cannot be rivaled. The FACTORY EDITION is a formula for success. BODYWORK & GRAPHICS: KTM R&D, KISKA Design and all our factory riders had their say in shaping the plastics with one goal: complete harmony between rider and bike. New slimmer bodywork create a package that is easier to move around on in the heat of battle. CHASSIS: The chassis of the 450 SX-F FACTORY EDITION is known for its easy handling and excellent stability. The stiffness of the frame is designed to improve bump absorption while the new CNC-machined FACTORY triple clamps benefit both handling and fork action. Updated WP Suspension settings complete a package that ensures the 450 SX-F FACTORY EDITION is an unstoppable force in any situation. FRAME: The frame on the KTM 450 SX-F FACTORY EDITION is made of professionally crafted hydroformed Chromium Molybdenum steel tubes which are robot welded for the highest levels of consistent quality and strength. The frame stiffness is designed for optimal handling, comfort and high-speed stability. The orange powder coated frame is fitted with color matching frame protectors and a carbon fiber reinforced skid plate. SWINGARM: The cast aluminum design offers low weight and a perfect flex behavior. The single-component casting process eliminates any inconsistencies and inherent weak points created by welding. ENGINE: KTM's hugely successful 450cc SOHC engine is already known as the lightest and most powerful on the market. A compact design contributes to maximal mass centralization for better handling. Featuring several updates compared to the standard model, the 450 SX-F FACTORY EDITION produces unrivaled power and rideability that will shoot both pros and amateurs alike to the top of the podium. CYLINDER HEAD: At 15mm lower than the previous generation, the cylinder head puts the camshaft closer to the center of gravity of the bike. The cam features a special surface treatment and rides on low-friction DLC rocker arms to actuate lightweight titanium valves. A low-friction cam chain completes the highly efficient and compact valve train. CRANKSHAFT: The crankshaft utilizes a short connecting rod, which makes for an overall compact and lightweight engine with a snappy power delivery. A plain big-end bearing with two force-fitted bearing shells runs directly on the crank pin. The necessary oil feed for this bearing is ensured by the engine’s pressurized lubrication. This design is a decisive benefit in terms of the crankshaft service interval, which can be lengthened due to the plain bearing. CRANKCASES AND ENGINE COVERS: The design of the die-cast engine cases allows for minimal weight and a very centralized shaft configuration. This makes the engine short and compact, while contributing to an efficient centralization of masses. The engine covers also feature a solid surface structure, which reduces the wear caused by the rider’s boots. 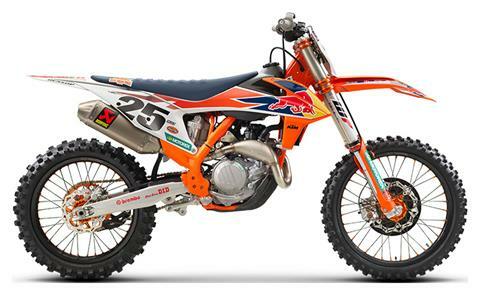 TRANSMISSION: The KTM 450 SX-F FACTORY EDITION uses a lightweight 5-speed transmission with gear ratios that are perfectly matched to the power delivery of its large displacement engine. The gearbox of the 450 SX-F FACTORY EDITION is produced by Pankl and features high-strength material and a special heat treatment. An advanced ´No Dirt´ gear shift lever design prevents mud and sand from blocking the joint of the lever and guarantees trouble-free shifting. The engine is fitted with a gear position sensor, giving the option of different engine characteristics for each gear. CYLINDER AND PISTON: Inside the short cylinder, with a bore of 95mm, thumps a new forged box in box piston with a hard anodized compression ring groove and an optimized profile. Its crown geometry is adapted perfectly to the high-compression combustion chamber, where its rigid structure and low weight shine. Thanks to the low oscillating masses, the engine is as snappy as it is strong. CLUTCH: The 450 SX-F FACTORY EDITION features a DDS (Dampened Diaphragm Steel) Clutch that is actuated hydraulically by a Brembo master and slave cylinder. The single diaphragm steel pressure plate offers better feel and function than a traditional multiple coil spring set-up. The damping system provides better traction and reliability while the CNC-machined basket allows for thin steel liners for a compact design. A special replica Hinson billet clutch cover is fitted to the FACTORY EDITION. E-STARTER: Like all KTM 4-stroke motorcycles, the 450 SX-F FACTORY EDITION is started at the push of a button - a priceless advantage when you’re on the clock. HANDLEBAR MAP SELECT SWITCH: All 4-stroke models are equipped with a sophisticated multi-functional handlebar map select switch, which does three things: activation of the traction control, activation of the launch control, selection of two power curves. The traction control guarantees more efficient traction when the track conditions are less than perfect. With this map select switch the rider can also activate the launch control, which provides more efficient starts out of the gate so you can go for the holeshot. How? It simply reduces the maximum engine speed for the very first moments of the start, in order to give you better control. In addition, the map select switch gives the rider the chance to select an alternative, more powerful map beside the standard configuration. READY TO RACE: ergonomics give you the edge on the track, ride harder for longer. BATTERY AND WIRING HARNESS: A strong lithium ion 2.0 Ah battery breathes life into the engine and contributes to low vehicle weight. The lightweight battery and wiring harness are centralized in a compartment above the air filter box, allowing the mechanic to remove the subframe without moving the electronics.